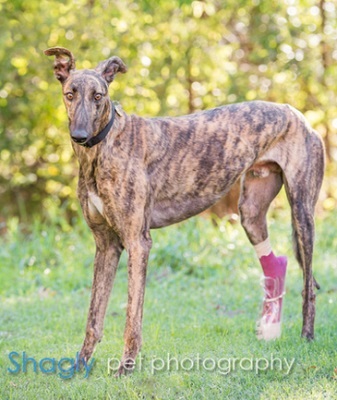 Xfactor, aka Chasin Xfactor, is a 2-year-old brindle male born December 9, 2013. His sire is Yahoo Omar and his dam is Turbo Remarkable. He has 16 races on record at Greyhound-data.com, all at Gulf Greyhound Park. starting in August of 2015. Xfactor's career ended on November 14 with a central tarsal bone fracture. Due to Xfactor’s severe central tarsal bone fracture, an external fixator (lineur and circular) was applied on November 23, 2015. It was removed on January 6, and he has now completed all his medical procedures. As with all repaired fractures, should irritation occur the implanted screws may have to be removed in the future. He has not yet been tested with cats or other small animals. Xfactor has some spectacular ears! Due to Xfactor’s severe central tarsal bone fracture, an external fixator (lineur and circular) was applied on November 23, 2015. 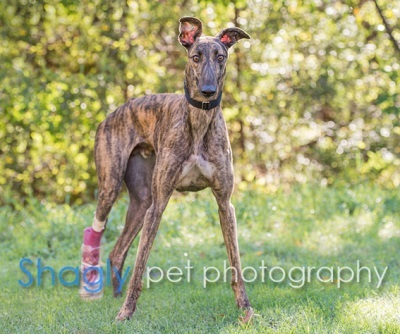 It was removed on January 6, and he is being kept quiet in his foster home with a soft padded bandage for the next 4 weeks. The fracture appears to be healing well.